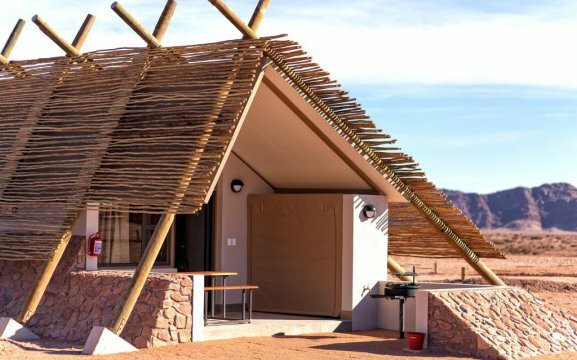 The Desert Quiver Camp is a modern self-catering establishment and is situated only 5km away from the Sossusvlei entrance. 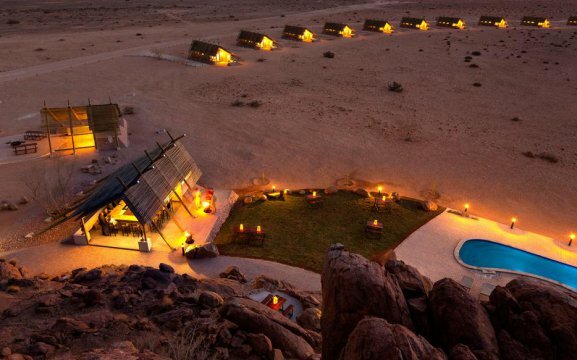 It is surrounded by granite outcrops with stunning views and roaming wildlife. Our camp features a fully stocked bar, 2 communal boma areas for families and large groups travelling together, we also have an outdoor pool with views towards the Elim Dune and a restaurant near-by. Guests can request for utility boxes with the needy things for self-catering and also fresh food supplies that are being ordered daily. We have a fully stocked shop, fuel and Internet Café close-by at the Sossus Oasis Service Station. Just opposite the reception area are two communal bomas, which provide a perfect spot for groups and families to come together for a braai or just to socialise. Both bomas have a small kitchen with a stove, fridge, wash-up facilities and a preparation area. The seating area around the firepit has loose cushions with wooden benches. 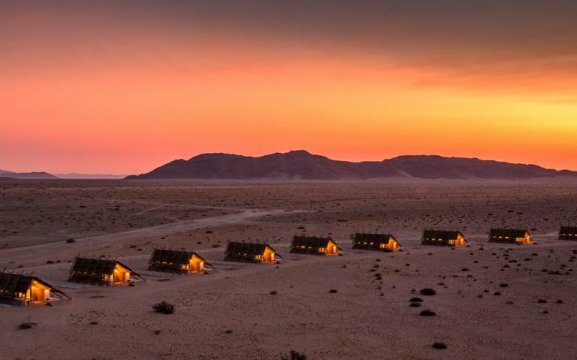 We also offer special functions and bush dinners in the heart of the Namib Desert, with beautiful views of the towering red sand dunes – upon request. 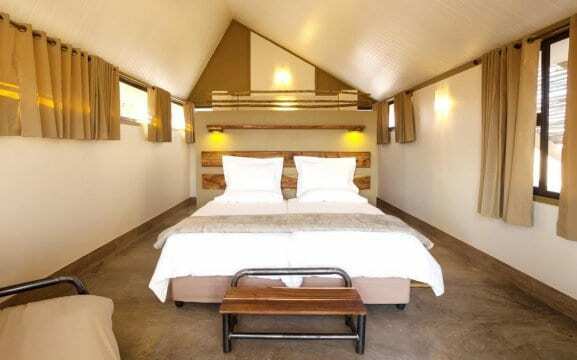 Our accommodation comprises in uniquely designed chalets with spacious bedrooms and en-suite bathroom with shower. 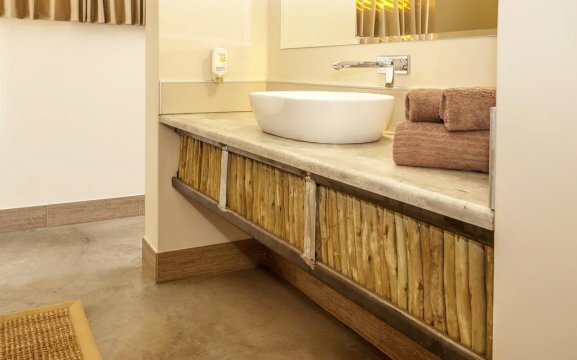 Each unit features a small terrace, fitted with a kitchenette, minibar, seating area and braai facilities. The rooms feature ceiling fans, wardrobe, safe, twin-beds and a fold-out sleeper couch to accommodate two small children under 12. 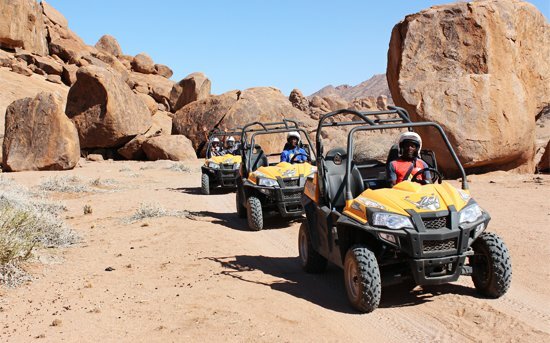 The Desert Quiver Camp offers activities to Sossusvlei, the Sesriem Canyon, stargazing, helicopter flights and scenic flights, quad buggy nature trails, archery, hot air ballooning, hiking at the Elim Dune nature trails and sundowner / nature drives. 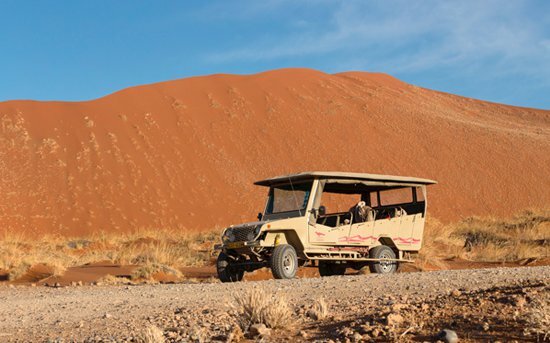 Guests can climb Dune 45 in Sossusvlei and visit Deadvlei and the Hiddenvlei in search of superb scenery and desert-adapted animals and birds. After that we visit the Sesriem Canyon in the afternoon for a short hike along the canyon where pools of water attract all sorts of life here. Enjoy a refreshing drink and snack on our sundowner-nature drive and see our spectacular Namibian sunset. A must attend activity is the hot air ballooning with an exclusive Champagne Breakfast. 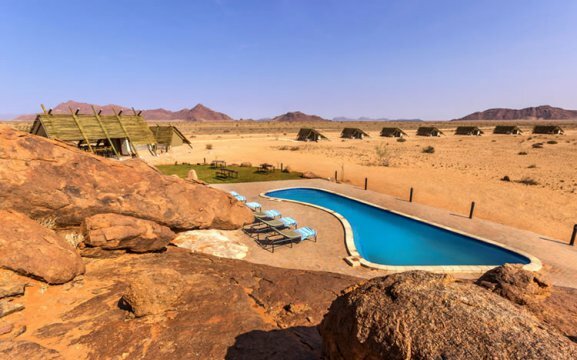 If you want to consider other accommodation options near Sossusvlei you can take a look at Desert Camp (also self-catering) or the stylish and luxurious Sossusvlei Lodge both within close proximity to Sesriem/Sossusvlei. 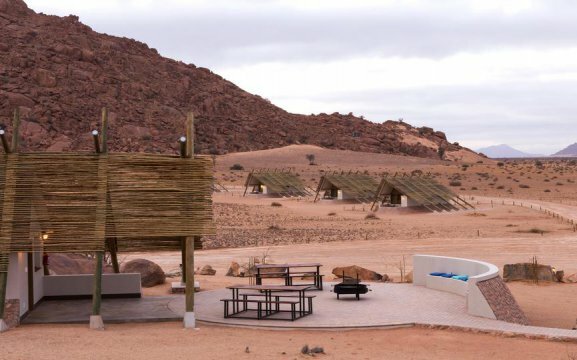 For camping sites close to Sossusvlei look no further then Sossus Oasis Camp Site. If you plan to travel to Swakopmund or Etosha the consider staying at Hotel Zum Kaiser or Etosha Village which is only 2 km’s from the Andersson Gate to Etosha.